Sacks’s words could equally be taken to mean those who align themselves with Israeli hate and the wish to kill Palestinians and wipe Palestine from the map – which they have already done quite literally. And if Corbyn defiles our politics so does the Israel lobby. But the irony must have escaped him. Just how righteous is the moralising Lord Sacks? In a House of Lords debate in 2014 on the Middle East in general and the question of formal recognition of Palestine by the UK in particular, the former chief rabbi got up and made a speech that was more like a pro-Israel rant. After a long winded spiel about the history of Israel and Jerusalem – from the Jewish angle of course – he went on to demonise Hamas and Hezbollah in the manner recommended by Israel’s hasbara handbook and all the more absurd when Israel’s hands are so unclean. Everyone knows that Hamas has agreed to a long-term truce with Israel provided it ends the illegal occupation, gets back behind its 1967 borders and accepts the refugees’ right of return – all as per UN resolutions and subject to a Palestinian referendum. And Hezbollah, as Sacks knows perfectly well, was formed to resist the Israeli occupation of Lebanon after the 1982 war. Where does he get his information? Israel won’t define its boundaries, leaving them fluid for endless expansion, and does a first-class job of delegitimising itself by its defiance of international law and utter contempt for norms of human decency and obligations under the UN Charter and other agreements. Zionists distort the scriptures to claim Jerusalem is theirs by divine right, but it was already 2,000 years old and an established, fortified city when King David captured it. The Jews lost Jerusalem to the Babylonians, recaptured it, then lost it again to the Roman Empire in 63 BC. When they rebelled Hadrian threw them out in 135. Until the present illegal occupation the Jews had only controlled Jerusalem for some 500 years, small beer compared to the 1,277 years it was subsequently ruled by Muslims and the 2,000 years, or thereabouts, it originally belonged to the Canaanites. Jerusalem was also a Christian city. The 4th century saw the building of the Church of the Holy Sepulchre. The Persians came and went. Then, after the Islamic conquest in 690, two major shrines were constructed over the ruins of the earlier temples – the Dome of the Rock from which Muhammad is said to have ascended to Heaven, and the Al-Aqsa Mosque. The Crusaders retook Jerusalem in 1099 and the Temple Mount became the headquarters of the Knights Templar. In 1187 Saladin ended the Crusader Kingdom and restored the city to Islam while allowing Jews and Christians to remain if they wished. It is what the rabbi failed to say on this important occasion that makes me wonder whether he’s an instrument of God or just another preacher of Israeli hasbara. I read somewhere that Lord Sacks is of Polish/Lithuanian extraction. Most Palestinians can demonstrate ancestral ties to the ancient Holy Land. Can he? Corbyn is also in trouble over a remark he made in 2010 at a meeting of the Palestine Solidarity Campaign suggesting that MPs who took part in a parliamentary debate on the Middle East had their comments prepared for them by the Israeli ambassador. I’d say that was fair comment, although the scriptwriters were more likely to have been Mark Regev’s propaganda team in Tel Aviv. Regev, a propaganda expert from the dark side, is now Israel’s ambassador in London. Oh, the irony (again). 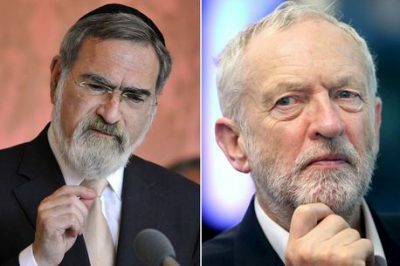 Feldman wrote an open letter to Corbyn telling him that Jewish people were making contingency plans to emigrate because Labour had become a hotbed of anti-Jewish feeling. Lewis, who describes himself as an “unapologetic Zionist”, said: “Jeremy Corbyn moved the rock and the anti-Semites crawled out from underneath.” And he told the Evening Standard: “I don’t feel welcome in this country anymore.” So he’s off to that hotbed of racism and apartheid, Israel.